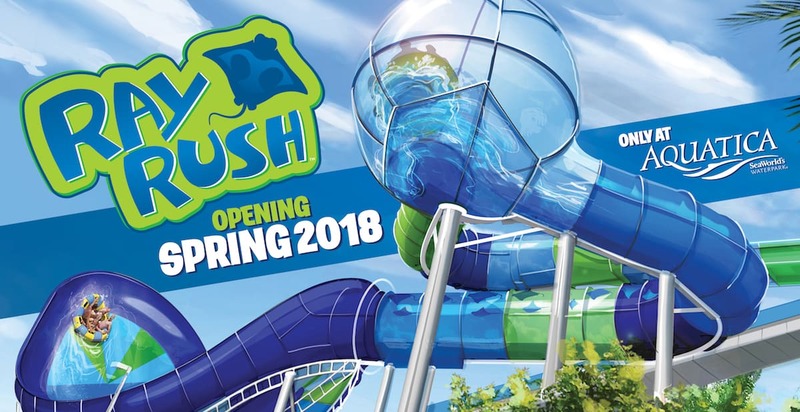 The park announced the addition of Ray Rush this past October. The new slide is located on the north side of the park next to Walkabout Waters. A neighboring attraction which was temporarily closed to accommodate the construction of Ray Rush, Walhalla Wave, reopened this past weekend. Guests can join the conversation online using #RayRush. For the latest #AquaticaOrlando news and updates, guests can follow Aquatica on Facebook and the park’s brand-new Instagram channel. From high-speed water slides and exhilarating wave pools to tranquil beaches, Aquatica, SeaWorld’s Waterpark® Orlando, delights all ages and interests. This one-of-a-kind waterpark is home to some of the world’s most thrilling water rides, featuring 42 slides, rivers and lagoons and 84,000 square feet of sparkling white, sandy beaches. Get ready to brave a watery free-fall on Ihu’s Breakaway Falls™ – the steepest and only multi-drop tower slide of its kind in Orlando. Aquatica, SeaWorld’s Waterpark, offers exclusive attractions that promise unlimited fun, sending guests on amazing undersea adventures. Aquatica Orlando was recently voted “Best Water Park” by Orlando Sentinel readers in the publication’s annual Best Bets reader’s choice awards in 2017. SeaWorld Entertainment, Inc. (NYSE: SEAS) is a leading theme park and entertainment company providing experiences that matter, and inspiring guests to protect animals and the wild wonders of our world. SeaWorld Parks and Entertainment, Inc. is a wholly-owned subsidiary of SeaWorld Entertainment, Inc. The company is also one of the world’s foremost zoological organizations and a global leader in animal welfare, husbandry and veterinary care. The company also rescues and rehabilitates marine and terrestrial animals that are ill, injured, orphaned or abandoned, with the goal of returning them to the wild. The SeaWorld® rescue team has helped more than 31,000 animals in need over the last 50 years. SeaWorld Entertainment, Inc. owns or licenses a portfolio of recognized brands including SeaWorld, Busch Gardens and Sea Rescue®. Over its more than 50-year history, the company has built a diversified portfolio of 12 destination and regional theme parks that are grouped in key markets across the United States. The company’s theme parks feature a diverse array of rides, shows and other attractions with the broad demographic appeal which deliver memorable experiences and a strong value proposition for its guests. Copies of this and other news releases, as well as additional information about SeaWorld Entertainment, Inc., can be obtained online at www.seaworldentertainment.com. Shareholders and prospective investors can also register to automatically receive the company’s press releases, SEC filings and other notices by e-mail by registering at that website.